Remember Hurricane Florence? Remember Hurricane Michael? If not, just take a look at the ContactRelief video below as Hurricane Michael slams in the Gulf Coast, travels up the deep south, and exits into the Atlantic ocean. 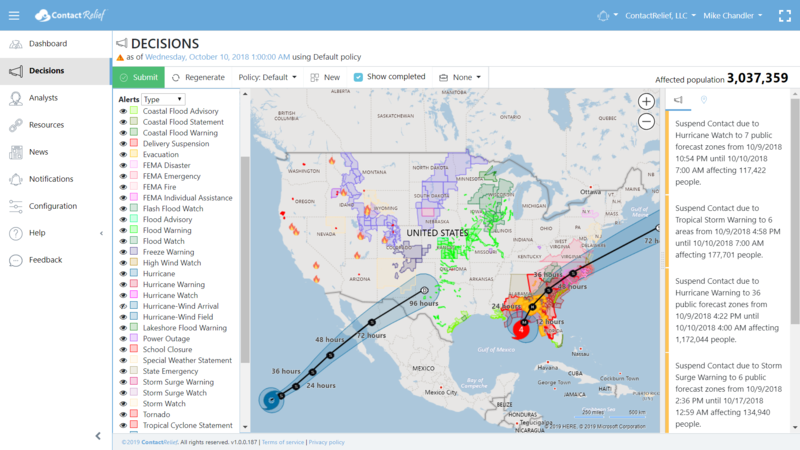 If you were a ContactRelief subscriber, you got the complete picture including the hurricane track and wind field and related FEMA disaster declarations, damage estimates, real-time power outage levels, and much more not shown. The last few years saw above-average hurricane seasons - including the record-setting 2017 which brought the devastation of hurricanes Harvey, Maria, and Irma. Get prepared for this hurricane season before it's too late. With ContactRelief, our cloud-based platform modernizes your disaster operational strategies, ensuring you maintain efficiencies while protecting your brand, no matter the disaster. Through timely, comprehensive recommendations that are accurate to the ZIP Code, ContactRelief’s automated Disaster Decision Engine provides precise, actionable intelligence that lets you discover what’s affecting your customers, decide the appropriate response, and instantly direct contact suspension and resumption where necessary across your whole contact ecosystem. The next disaster is on its way. Become a ContactRelief subscriber and keep your company protected from disaster. Our full recommendations consist of the areas to be suspended and the list of zip codes covering these areas. With minimal effort, your company can quickly implement a solution that protects your company and its customers. As we say at ContactRelief, "It's just smart business." There's no software to install. Just subscribe and start receiving recommendations based on your customized disaster response policy with all the information you need to implement your disaster response plans and shape your consumer contact strategy. We even offer direct integration with telephony systems so your response will be immediate and fully automated. (Genesys customers - see us in the Genesys AppFoundry). Find out why many of the nations leading financial services, retail, and telecommunications companies rely on ContactRelief to protect their brand reputation during times of crisis.